You are here: Home / Bargains / Babies and Kids / HarperCollins Book Review by my 2nd Grader & Giveaway! HarperCollins Book Review by my 2nd Grader & Giveaway! 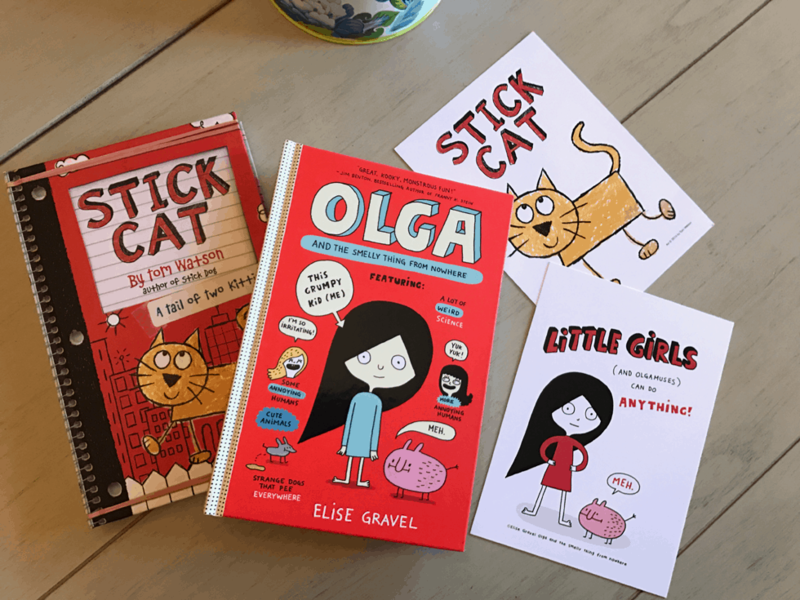 I was really excited to get sent Olga and the Smelly Thing from Nowhere and Stick Cat to review on the blog. When my copies arrived, I wondered if my 2nd grade would enjoy reading these books that were considered “middle-aged”. 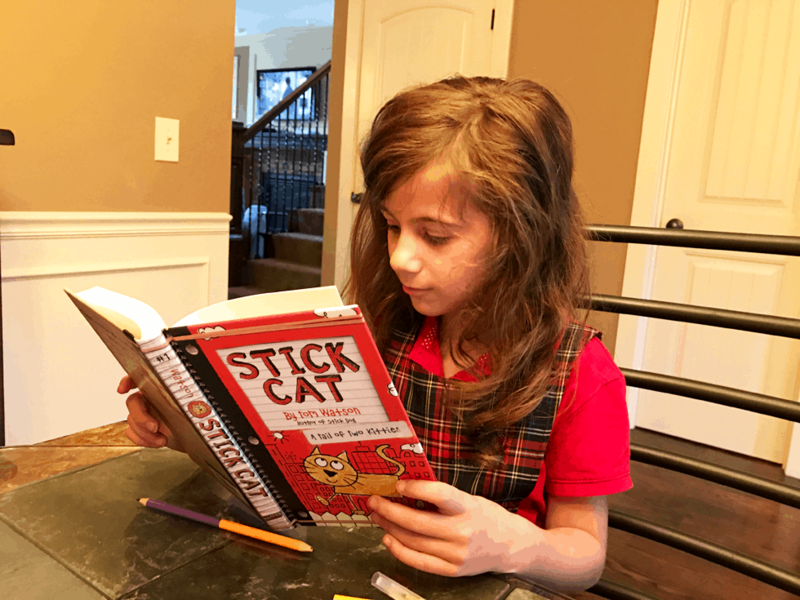 When our package arrived, I took it out of the box and my 2nd grader started yelling, “Stick Cat, is that Stick Cat!” I found out that her classroom has “Stick Cat: A Tail of Two Kitties” and she has started to read it but hadn’t finished. Now she is SUPER excited about the NEW Stick Cat book “Cats in the City”! Thank you to HarperCollins for providing me with copies of this book! 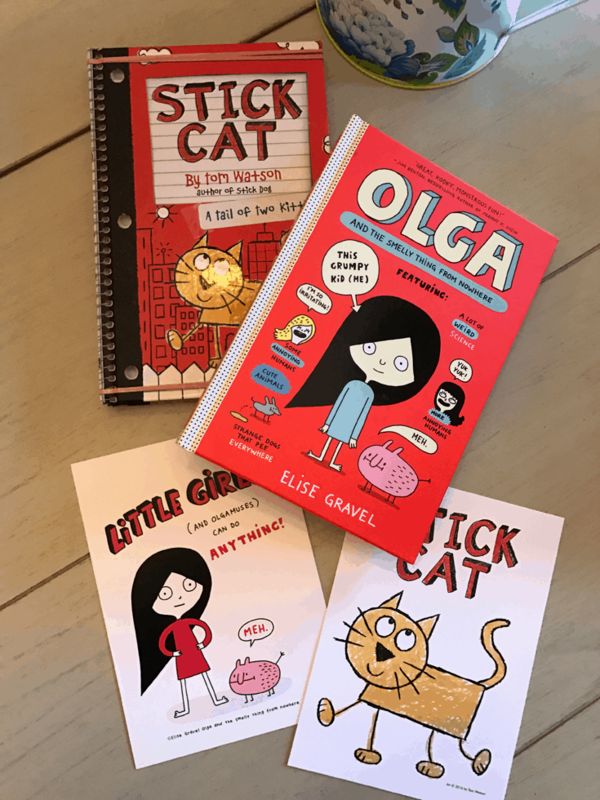 We took a look at both Olga and the Smelly Thing from Nowhere and Stick Cat and they both caught our attention! My daughter spent sometime looking at the first book. The next morning unannounced she woke up early and read the all of Olga and the Smelly Thing from Nowhere. She told me that it was so funny and that she didn’t want to put it down to stop reading! I am so excited to also be having a giveaway and giving a prize pack to one lucky reader! Be sure to enter the simple Rafflecopter for a chance to win! Release: March 14, 2017 – In Stores Now! It won’t eat, it won’t sleep, it snores, it stinks, and Olga studies it like mad. She adores it and eventually names it after herself–an OLGAMUS. A trip to the library reveals little, while a trip to the local shop proves successful when Olga discovers Meh’s favorite food is olives! Perfect for fans of Dear Dumb Diary and My Big Fat Zombie Goldfish, and great preparation for El Deafo, Roller Girl, and Smile. Perfect for fans of Diary of a Wimpy Kid, Big Nate, and animal lovers everywhere – meet Stick Cat! A heavily illustrated young reader series, from the author of Stick Dog – Tom Watson! In the first adventure (available now), it’s a big day in the big city for Stick Cat and his best friend, Edith. There are treasures to hunt, songs to sing, pigeons to catch, and naps to take. But way up on the 23rd floor, danger lurks just around the corner. Terrible noises and violent crashes trap a desperate man in the building across the alley. Stick Cat will need to navigate his way across the alley—and around Edith’s peculiar ways—to attempt a rescue. 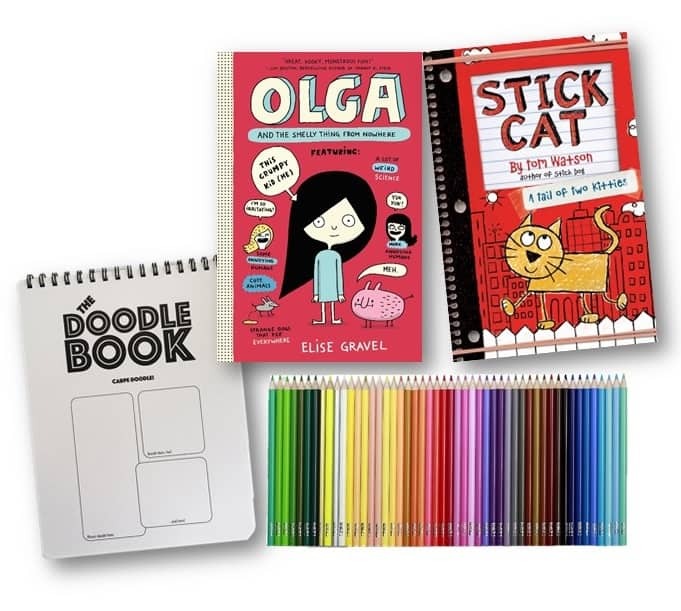 Plus notebook and colored pencil set. I remember loving the Ramona books. Our library would absolutely love these books! As a kid I remember reading The Very Hungry Caterpillar. My favorite book as a child was Charlotte’s Web. One of my favorite books to read as a child was ‘Today I Feel Like A Warm Fuzzy’. Thanks. I read a lot of Babysitters Club books. I remember reading a lot of Sweet Valley High! I read a lot of Ramona and Beezus books. I remember reading The Babysitter’s Club as a kid. I read Donna Parker books. I remember reading A Wrinkle in Time by Madeleine L’Engle. Very cool? My 2nd grader would ❤️ love! I always loved Nancy Drew and Curious George books. I like the Babysitter’s Club Books when I was a kid. I remember loving all the Babysitter’s Club books. I remember reading the Babysitter’s club books and also loved Roald Dahl books! My favorite though would have been Little house on the Prairie books, I had the whole set and have now bought the whole set to read with my daughter. i remember reading Goosebumps and Rl Stine books! I read Charlotte’s Web as a kid. I remember the Bobsey Twins series. I remember reading Judy Blume books when I was younger. I would say Charlotte’s Web. I was always a big fan of the Very Hungry Caterpillar! I remember reading A Wrinkle in Time and all the other books in the series! I read every single Nancy Drew book that i could get my hands on! my fave book were the toad and frog books! I remember reading the Nancy Drew series. Love it!! I read the Babysitters Club books. I remember reading The Boxcar Children and the Babysitter’s Club books. I remember loving the Berenstain Bear books! as a kid i loved amelia bedilia and henry and mudge. I remember Charlie and the Chocolate Factory and all the Judy Blume books. I like the Fudge books when I was a kid! I read Matilda so many times as a kid! I still love it now. I remember ready Black Beauty was I was young. the berenstain bears was a favorite of mine. I remember reading TONS of books, but my favorite series was The Babysitter’s Club series! I read Oz books, and C.S. Lewis books, and “Misty Of Chincoteague,” etc., etc. I remember reading the Berenstain Bears books. I remember reading the babysitter club books as a kid! I remember reading Dr. Seuss books as a kid. I used to like reading the Nancy Drew series and Boxcar Children series. I remember reading Dr. Seuss books at my cousins when Dr. Seuss was considered bad literature for kids. We knew it wasn’t so! I read Nancy Drew and the Little House on The Prairie books. Little House On The Prairie. Loved all of the books in the series. The Babysitter’s Club was some of my favorite books when I was younger! I read 1984 by George Orwell when I was in 7th Grade. This would be perfect for my 7 year old daughter! She loves to read!